No matter where you're planning on going in Canada, April is a great time to get a travel bargain on a trip to this northern country. Many hotels, airlines and tour companies offer savings in this part of spring before the busy summer season sees tourists flock to the biggest cities in the country. However, what you can expect from the weather, what you'll need to pack to be comfortable, and what you can do on your trip greatly depends on where you want to go this April. Whether you're looking for a chance to explore the outdoor attractions opening for the season in Vancouver without the crowds or you want to ski on the mountains outside of Montreal, there are plenty of ways to enjoy your trip to Canada this April. By April, spring temperatures have firmly settled over Vancouver and the west coast; nevertheless, the ski season in northern Whistler is still going strong. Elsewhere in the country, the chill of winter is disappearing but weather can be unpredictable—so you should be prepared for a variety of weather. Across the country, you can expect average highs between 14 degrees (in northern places like Iqaluit, Nunavut) and 55 degrees Fahrenheit (in southern cities like Vancouver, British Columbia). However, no matter where you go, you're likely to run into rain on anywhere between 10 and 16 days out of the month; but if you want to avoid the wet spring weather, you can head to Edmonton or Calgary in Alberta, which both receive little to no rain this month. What you pack depends on where you are going in Canada, but you should probably bring a winter coat, warm and water-resistant outerwear, an umbrella, comfortable closed-toe shoes and boots, and a range of clothing for layering. Staples like t-shirts, sweaters, light pants, heavy slacks, and a pullover jacket are also recommended. If you're heading to Toronto or Montreal, you may need to bring more layers since temperatures can still drop below freezing, but for Vancouver, you'll just need to pack a few layers and make sure you're ready for an occasional rain shower whenever you go out. 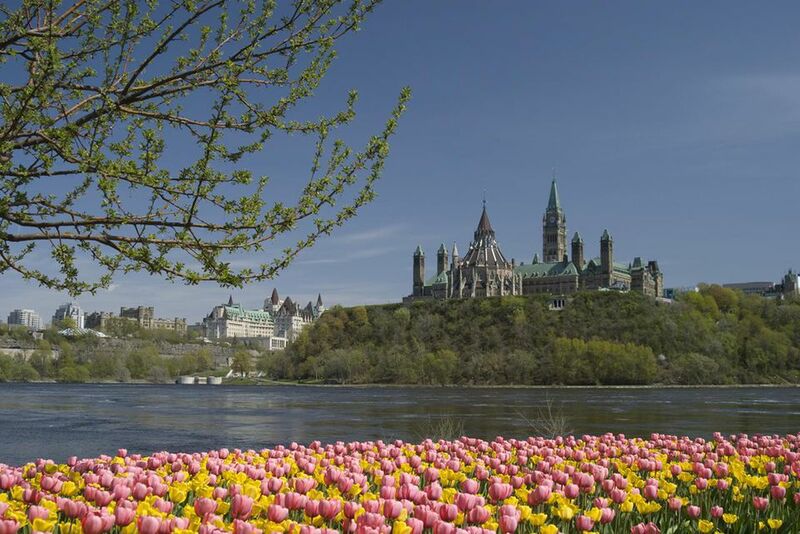 From the last of the winter sporting events to the first of the warm-weather activities, there are plenty of ways to celebrate this April in Canada—depending on which part of the country you're visiting. While Easter and Carnivale are often celebrated this month (if not March) across Canada, you can also stop by Newfoundland for a unique observance of St. George's Day. Blue Metropolis International Literary Festival: Throughout the month of April, this celebration of literature takes over venues across Montreal for writing workshops, author readings, storytelling, and a variety of seminars and discussions. Loads of travel deals and discounts on popular tourist activities are available this month, and the warmer weather means more attractions will be opening and more outdoor activities will be available across the country. However, snow melting and spring showers can mean wet, muddy conditions, especially outside of the cities. While you can still enjoy hiking and camping this time of year, you may need to prepare for worse conditions in April than later in the spring or summer. Weather is unpredictable, which is why dressing in layers is so advisable, and you should always carry a small umbrella in case of a sudden shower while you're out exploring the countryside. Easter in Canada falls sometime between March 22 and April 25, which may mean holiday closures for government offices, local businesses, and even some restaurants and bars. Newfoundland observes St. George's Day on the Monday nearest April 23. Check to see that any stores or offices you plan to visit are open if you're traveling in this region. Skiing remains popular in spring and lots of spring skiing vacation deals are available around the country—even at some of Canada's best-known resorts.